Each relationship brings with it the possibility of never-ending fascination and growth, but it also carries within it the seeds of its own destruction. Building upon the ideas presented in Meeting Your Selves, this talk will introduce you to the concept of "bonding patterns" and the Stones' revolutionary "no fault" approach to relationship. 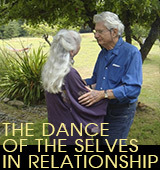 It explains how you can make each of your relationships an exciting and positive experience, using relationship, itself, as a teacher, a healer and a guide.